Lovers, the re-introduction of boots and sweater dresses to our wardrobes is, of course, one of the highlights of autumn; but perhaps one of the most enchanting aspects of the fall season are the colors which signify the change in the air. The quartz, peridot, and garnet a la Custom silver flat briolette earrings yellow amethyst - Necklaces, Earrings, Bracelets & Jewelry Sets; the brooding, smoky onyx and currant shades of Custom black hoop earring - Necklaces, Earrings, Bracelets & Jewelry Sets; and, most importantly, the shimmering gold of the Paint me gold Designed by hianjana | Shop Online - Custom Jewelry at Sheyna – the very item that one (1) lucky lady will soon be calling her own! You guessed it, kitty cats! Café Fashionista has teamed up with Sheyna Jewelry – a company that allows you to design your own jewelry via an online tool wherein users drag and drop pieces onto a virtual sketchpad, and arrange them in a fashion they see fit to create the gem of their dreams – to bring one (1) blinged out beauty a pair of the Paint Me Gold Earrings. ♥Visit Sheyna Jewelry and select which piece of jewelry is your favorite. ♥For one (1) entry, leave a comment on this post stating which piece of jewelry is your favorite between now and Friday, November 4, 2011 at midnight PST. ♥For two (2) entries, Tweet about this giveaway, and leave a comment on this post stating which piece of jewelry is your favorite between now and Friday, November 4, 2011 at midnight PST with your Twitter URL. ♥For three (3) entries, become a follower of Café Fashionista on Blogger/Google Reader/Google Friend Connect, or Twitter @cafefashionista, and leave a comment on this post stating which piece of jewelry is your favorite between now and Friday, November 4, 2011 at midnight PST (if you are already a Café Fashionista follower, please say so in your comment). I will randomly pick one (1) name out of a hat (who knows, it could be yours! ), and announce the winners on Saturday, November 5, 2011. Thanks to Sheyna for the picture. This looks so fun. Great giveaway! Thanks for this darling! The Deina is lovely! Great giveaway!! I'm (of course!) a follower of your blog and love the Tranquile earrings! Such pretty jewelry! I love the red onyx earrings. Such a pretty color! 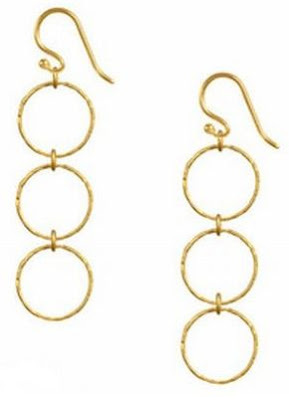 I love the Gold plated Oval ring charm earrings. I'm in love with the Swatiring: http://www.sheyna.com/jewelry/shop/designer/swatiprabhat/swatiring/19595/. It's ridiculously fabulous. those earrings are awesome. i'd take those please! great giveaway, i once again wish i lived in the u.s.! OMG their jewelry is fantastic and so affordable!! I really love the gold ring earrings!! Already following you on google. Gorgeous earrings Erika! I do love gold so my fingers are crossed! Have a lovely weekend! ooohhh I saw this earrings that are amazing: rain drops in turquoise. I love your earrings- the triple circles are gorgeous! Pretty!! I love long earrings!! I follow them on twitter too!! I like the Pearl delicate earrings. Great giveaway! I love the Horseshoe Charm Necklace! I follow Sheyna Jewelry on twitter! What a great giveaway! There were so many beautiful pieces to choose from so it was really hard to pick one but I think my favorite are the gold hoops on the first page. I think they would look awesome with any outfit!! Oh such stunning pieces! I love the Aqua Chalcedony Earrings but also the beautiful Paint Me Gold earrings! I'm a follower of Cafe Fashionista! I'm following Sheyna Jewelry on Twitter!